It would appear that his “nightmare” has come true, albeit minus the laminated photographs. 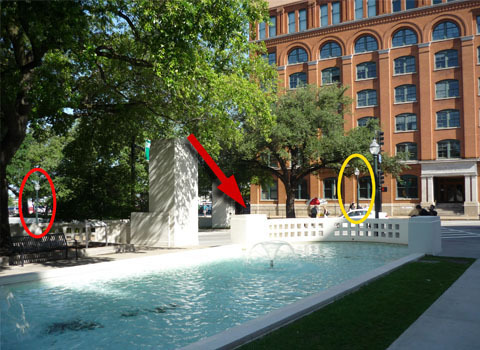 At the invitation of the museum, Holland presented his belief that Oswald’s first shot struck a traffic light mast pole and was deflected down toward the Triple Overpass where it wounded bystander James Tague – a belief that has no basis in fact as shown again and again on the pages of this blog. After showing his audience the evidence that supposedly supports his thesis – evidence that has been thoroughly dismantled – Holland insists that you don’t have to believe his conclusions, although from his perspective, if you don’t you’re clearly an idiot. “Now let me just point out here that our explanation of what happened is the plausible one – we believe,” Holland said, “in fact the only plausible one for why the bullet didn’t hit its mark when it was fired and where it went – but you don’t really have to believe it. “You can believe that Oswald fired in the air to scare the pigeons off the roof. You can believe he had a bad case of buck fever and that he fired errantly into the asphalt but somehow no one saw the kind of volcanic little eruption that would have occurred if a bullet traveling at that velocity hit asphalt. Did you catch the circular logic? 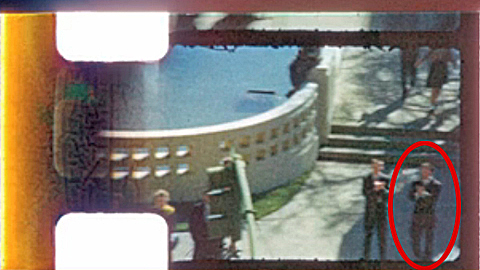 Zapruder only filmed two shots, according to Holland, because he only heard two shots and only saw the result of two shots. Seriously? I’ve become used to Holland’s irrational logic, mockery, and disdain for the truth but just in case you find yourself succumbing to this latest dish of ego-laden drivel consider the only new revelation in Holland’s ongoing effort to convince everyone of his brilliance – yet another newly uncovered witness “supporting” Holland’s alleged traffic light pole deflection. “Pierce Allman is the man on the right. Now if you look again at that still from the Secret Service restaging you have two men standing almost exactly in front of the steps where Pierce Allman and his colleague from WFAA were standing. As the 2012 article “Mr. 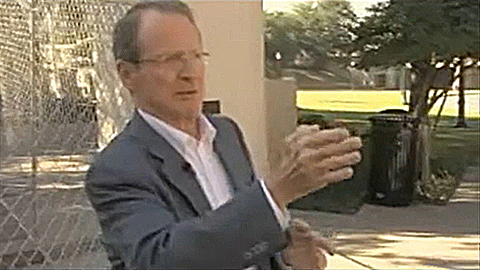 Holland’s Opus” showed in spades, Amos Euins’ contemporary statements clearly refer to the R.L. Thornton Freeway sign further down Elm Street, not the U.S. Highway sign cluster at the head of the street as Holland suggests. Now, Holland trots out former WFAA radio reporter Pierce Allman and insists that he too confirms an early shot. But that’s not true either, is it, Mr. Holland? 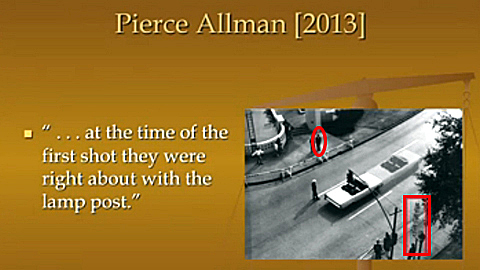 So in fact, Allman points to an area that is past his position when referring to the location of the limousine at the time of the first shot – not the lamp post in front of him and slightly to his right. The lamppost that Allman is referring to is located at the former location of the R.L. Thornton Freeway sign. Gee, what a coincidence. 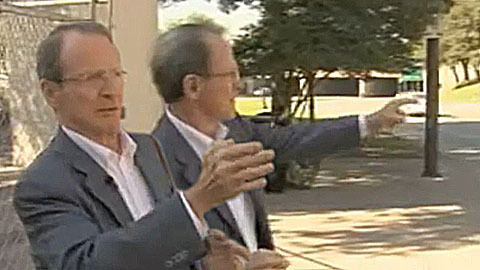 Allman places the limousine at the same location indicated by Holland’s two other star witnesses – Amos Euins and Patricia Ann Donaldson; the moment after the limousine passed under the traffic light mast pole but before it passed under the Live Oak tree branches. 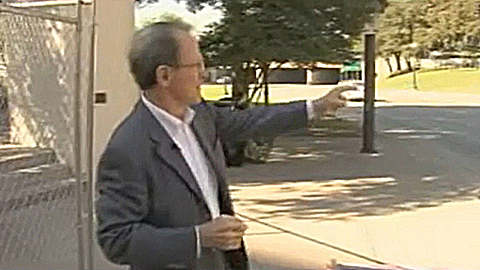 The real question is how Holland can look at the filmed interview of Allman and not know that he’s pointing to area considerably west of the lamp post he describes to his audience? It’s been eight years since Holland first proposed his theory of an early missed shot, fired before Zapruder began filming, and despite oodles of publicity he has yet to substantiate his theory with one verifiable fact. Not only are his eyewitness accounts twisted like a pretzel to fit his preconceived notion, but by his own admission there is not one bit of physical evidence to support his deflection contention. Indeed, late last month, a few weeks after Holland’s Sixth Floor Museum presentation, ballistic expert Luke Haag showed over 450 forensic scientists attending a conference in Dallas his peer-reviewed ballistic investigation into Holland’s theory which demonstrated that each and every one of Holland’s assertions about the potential deflection of one Oswald’s bullets by the traffic mast pole was physically impossible. It didn’t happen. It couldn’t have happened. One has to wonder, in the face of all the evidence to the contrary, why Holland continues to cling to a false history of his own making? He told the Sixth Floor Museum audience that the reason he started focusing on the first shot miss was because Secret Service agent Win Lawson was so insistent that there was a noticeable pause between the first shot and the second and third shots. Yet, Holland has never explained why his own timing of the supposed shot sequence sounds like three evenly spaced shots? Once again, we invite – no, we insist – that Holland listen to this clip and then publicly go on record stating whether or not he thinks this sounds like the last two shots are bunched together. Bet you won’t hear a peep out of Max. In the end, what difference would it have made even if Holland’s theory proved to be true (which of course, it hasn’t)? How would the fact that Oswald might have had an extra second or two (that’s a second or two more than we already know he needed) to fire all three shots alter our understanding of the assassination? Holland proposed to his Sixth Floor audience that the entire history of the controversy over Oswald’s guilt and the criticism of the Warren Report would have been smothered. Yet, Holland well knows that criticism of the official account of the assassination began long before the Warren Commission released their report with newspaper and magazine articles by Richard Dudman, Mark Lane, and others; and even entire books by Nerin E. Gunn and Joachim Joesten. This is basic JFK Assassination 101! Does anyone believe that conspiracy theorists would have gone to sleep for five decades had the Warren Commission simply proven that Oswald fired an early missed shot? And on what factual basis would the Warren Commission have resolved the disposition of an early missed shot? For eight years, Holland has been claiming that we’ve all been too mesmerized by the Zapruder film, that we’ve been unable to think outside the box, and that only he has managed to figure out how it all happened. Unfortunately, there are many media outlets far too eager to embrace unvetted musings about the assassination like Holland’s so long as it draws an audience. Dale's last sentence is sad, but true. Max Holland appears to be the latest in a long line of persons who, having gained notoriety and publicity for proposing a novel theory about the assassination, have now become "locked in" to their scenario and are either unwilling or unable to acknowledge any and all counter-evidence that proves them wrong. Just hard to imagine that a missed shot happened in the manner Max Holland describes. Wouldn't such a missed shot have sent hordes of people scrambling for cover? No one near that sharp hairpin turn off of Houston onto Elm seems the least bit aware, nor concerned about an errant shot. Could it be because there was no errant shot to contend with? There most assuredly was an early errant shot. However, there is no physical evidence to support Holland's traffic mast pole ricochet, no ballistic foundation to rest Holland's presumed physics upon, and no believable eyewitness support for an errant shot earlier than Zapruder's camera re-start at Z133. Despite Holland's foot stomping and shenanigans over the last eight years, he hasn't presented anything that establishes support for the timing or the impossible trajectory he imagines.